Looking for a GPS mount (Garmin 595 LM) to attach ABOVE the instrument cluster. To accomplish this, the appropriate mount would, it appears, attach to the windshield metal supports; using the handlebar Garmin supported ball & arms are not sufficient. 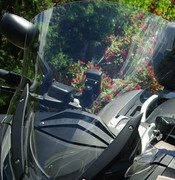 Have a Vstream 18.5" high windshield (replacing the 13" BMW sport windscreen). Thank you. Any comments would be appreciated. It will bounce around enough it will be difficult to read. I used the universal Ram mount for my iPhone. I used an Anker braided connector to a USB plugin. This kept the phone nearly dry, although the phone is water resistant. If a real rain was coming I'd stick the phone in my tank bag so I could still reference if need be. I used a cheap bluetooth headphone for spoken direction and turn alert tones. This set up worked pretty well. I had two half day rain events. The phone would have enough battery for about 6-7 hours navigating unplugged. The phone does run hot but never shut down. BTW the USB plugin is not water proof as I washed one on the bike and it shot craps. I had to fiddle with the mount so as to not obscure the instruments. I will use this set up again. That all said I had back up paper maps marked for my route and in the clear portion of the tank bag. Fairly simple to make - some aluminum tubing - cut the plastic caps flush off the top of the uprights, drill the remaining plastic plug for an M10 bolt (make the drill size slightly smaller than the threads on the bolt - the threads will cut their own threads in the plastic.) Cut some 1/2" OD aluminum tubing (Home Depot) to length - squish the ends, drill holes - mount. I used the black mount from a BMW GPS mount to mount the Garmin. You could also use "P" clamps. So far I've done this on 2 of my bikes, and 2 other R1200R's owned by friends. None have bounced. My current R1200R is sporting a BMW Navigator IV.. and I've slightly modified the tubing so it put the mount even closer to the rear surface of the windscreen. There was a BMW-ON article by me back in 2007 that detailed this - and other R1200R modifications I'd made. '12 R1200R - I love this bike! Looks like a nice setup Don. It is - it puts the accurate GPS speedometer within easy eye reach vs trying to figure out what lie the BMW one (numbers are too small, and too many divisions) is telling me. Barely have to move my eyes from the traffic lane ahead. Only problem is the Navigator IV screen washes out in direct sunlight. Supposedly the VI is better - but they said that about the IV - so I want to try one before springing for the big bux.. and it's easy to press the speech button on it (bottom left one) for when Doofus was mumbling.. Saw a 2011 RT with a Garmin Zumo(not sure what model) and it was mounted with a mount made by Migsel. Looked pretty nice almost factory but not sure of the cost or if its still made. I have a Migsel Mount on my 07 RT and love it. If you can park it, and not turn around to admire it before walking away, you bought the wrong one. Thanks very much for the information & effort to send me your photos. Yes, the 1200R is a nice bike. This is my 2nd - 1st one a 2007. Anyway, wanted to attach a photo of my new larger V-Stream windscreen that will not accommodate your recommended approach. The original BMW screen frame on the 13" screen I just replaced did have the mounting option frame - unfortunate! As you can see on the V-Stream, no option to attach the top bar, alas. So I had to go back to Garmin/Ram mount approach.